Benchmarks may be on private property or in dangerous locations. Obey local laws. By using the services on Geocaching.com you agree to this disclaimer. See the Benchmark by tour HQ2017. Found while visiting the area of the nearby archived virtual geocache. Glad to see this marker is still intact. Note to all armchair finders - -THERE ARE NO VIRTUAL BENCHMARK FINDS. You have to hack through the brush, crawl out onto bridges, walk up to the buildings, dig in the dirt. You have to HUNT! Now get out there an d actually DO IT :) you will love it. Found on the beautiful restored depot in downtown Van Buren AR today. 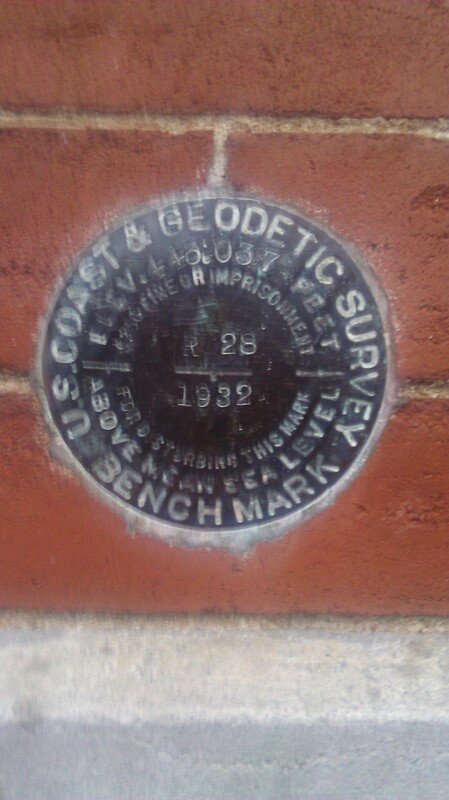 We found this benchmark on the side of the train station in Van Buren while we were in town on a geocaching expedition. 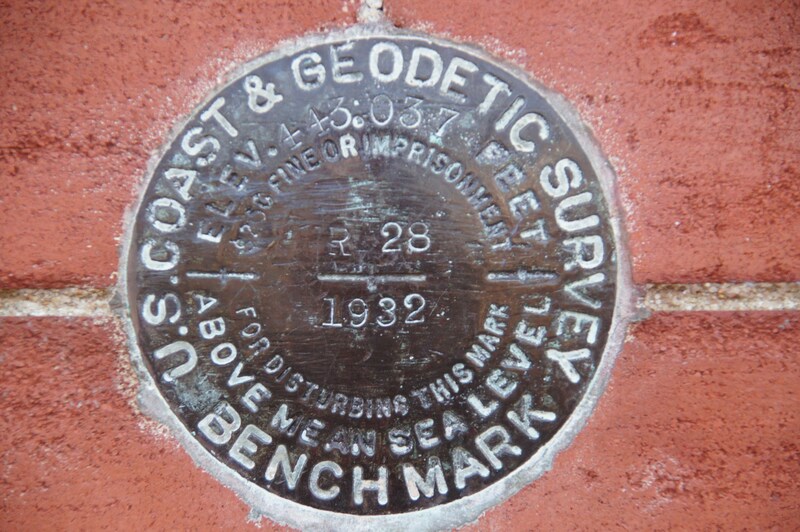 The benchmark was very easy to read, and we enjoyed finding it. "Congratulations" to all the jokers, who are logging an American Benchmark while being in Prague! All(!) those fake logs are from German "cachers". As usual, when a cache (or benchmark, in this case) is flooded with fake logs . Today I decided to do the 12 (13) Icon Tour with Napoleone1972, mawe50 and TheGreenTool. We started right after midnight with the Traditional , the Multi Cache and the Virtual before we went to bed to be ready for the CITO and the other Caches in the morning. We talked a lot about the 12, 13 or 14 Icon Tour. I decided for myself that I would definitely not log 14 since this would be cheating. I don't want to log an icon on the other side of the world I can't be at on the same day. I logged benchmarks while I was in the US and I was able to touch them. So it was at best a 13-Icon Tour for myself. Maybe I will come here one day while in the USA and I will be more than happy to log it then ! Found this one with my lady Tatauu2 while we were getting a nearby cache on a nice deserted Sunday afternoon. Me and Tatauu2 at the benchmark! Hers are the little hands! Made a quick find of this while grabbing a nearby cache! Me and Bif at the benchmark! Going incognito with the hand shot! Either my previous log was deleted or I forgot to log the benchmark. So, I will log the benchmark again as found. Was on a three day benchmark run with BasicPoke from Tulsa, Ok to Ft Smith, then north to Fayetteville and back to Tulsa. The woman in the museum said she had talked to a few people that were there to see the benchmark. We located the benchmark as described. The benchmark is in a perfect condition. Horrorheinz must be frustrated about something in his life. The last 200 (?) logs does not agree to the guidelines of gc.com. No one of them was at the benchmark. This entry was edited by Horrorheinz on Thursday, 20 September 2012 at 10:31:14 UTC. 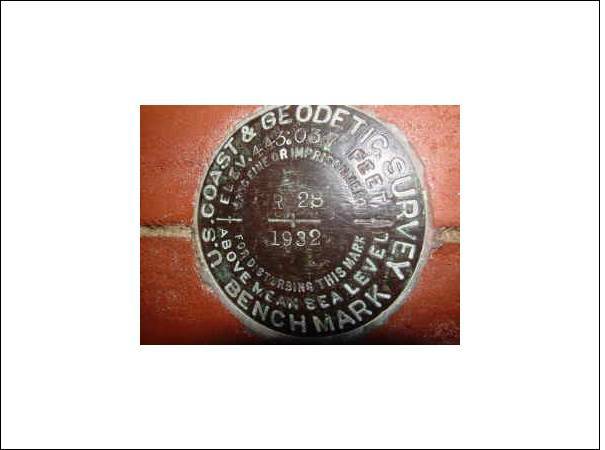 My 1st benchmark to find. This one is 2 blocks from my house. Took pictures and will upload later but the disc is in good shape. 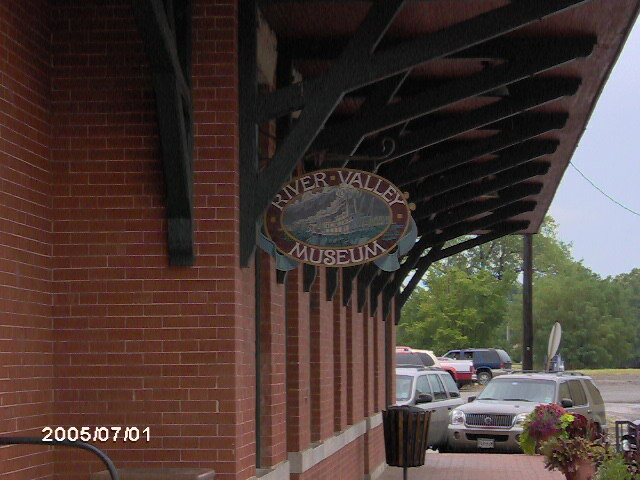 There is a passenger train that makes trips from Springdale to here and vice versa on a regular basis. Very popular in the fall when the leaves are changing color. 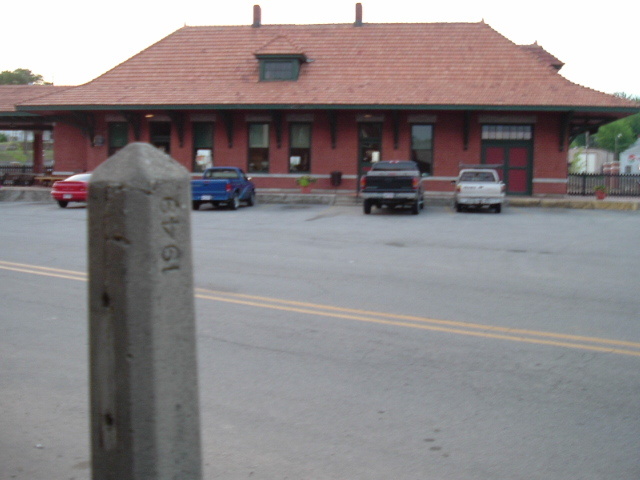 Seems like the old train stations all have a vertical reference marker. Curious to know why. We went and looked at this one today. 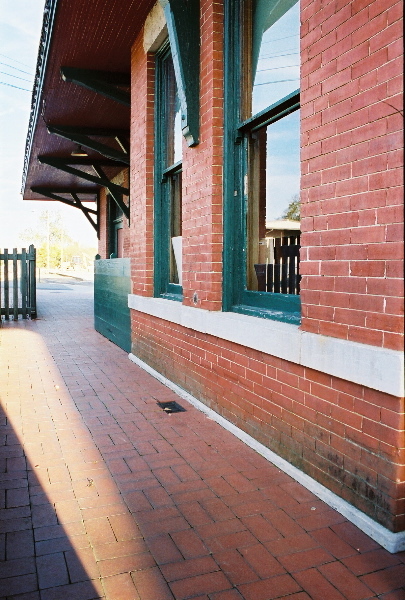 This station is still in use every day. RELOGGING the find since mine was deleted. At the time I was living no more than a mile and a half from this location. I spent time in the museum talking with the ladies and telling them about benchmarking and geocaching. I understand that there are people out there that will try to use photos to "couch log" benchmarks and caches but I am not one of them. Every cache or mark I log I was there, that is part of the fun of the adventure. super so komm ich auch auf mehrere tausend wenn ich nun alle benchmarks virtuel log?? "virtuell gefunden"? Selbstbeschiss nenn ich das. Niemand von euch war je bei N 35° 26.217 W 94° 21.083. Finally got around to stopping at this benchmark. 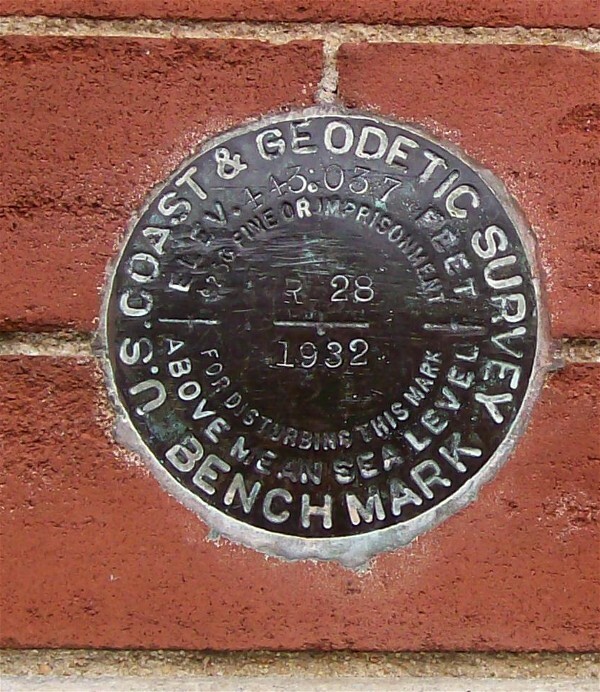 Found this benchmark while geocaching in the old downtown part of Van Buren, Ar. 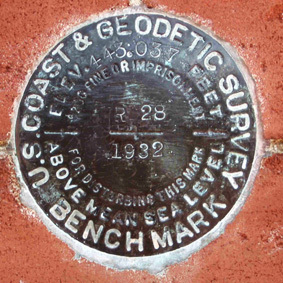 While looking for another cache we found this Benchmark. 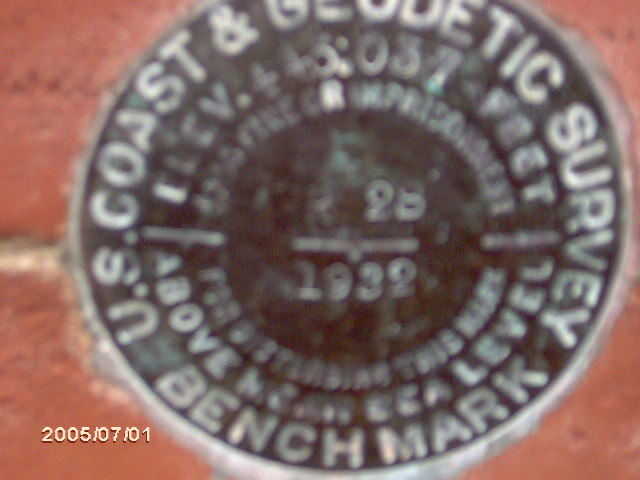 Found this benchmark while searching for another virtual cache. We found this while on a short geocaching run of the area. Very cold today. Found while searching a virtual. Found this nice benchmark on a tour. Found it while looking for the virtual cache Train Trex #7. Sometimes you can kill two birds with one stone . Found it while getting the virtual cache for this site. 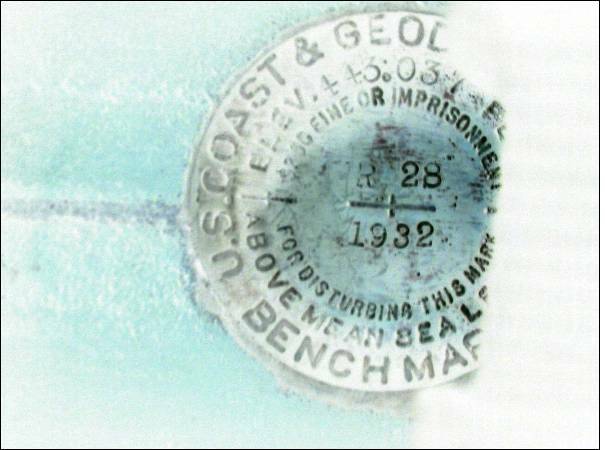 Found this benchmark as a part of a virtual cache. Found it as a part of a virtual cache. Found it as part of a virtual cache. While we were looking for a virtual we found this one. Found it on a virtual tour on the neighborhood. This is my first one and probably the only one on these near days. 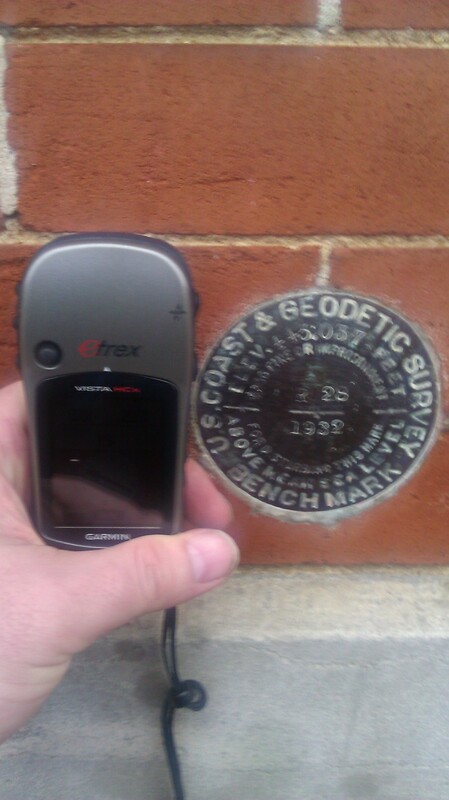 I found this benchmark on a virtual tour near the old Frisco depot during my research for the virtual cache 'Train Trex #7 (Van Bueren Depot)'. 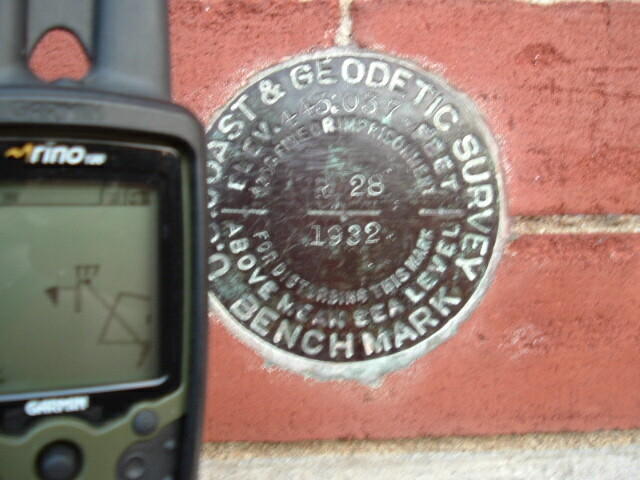 My first benchmark since i do geocaching. Found tis one while in Fort Smith Friday/Saturday but, couldn't log it at the time due to website problems. I found tis because of a virtual at the same location. Was my first Benchmark find. I may look for more in the future. Found because of the virtual. These benchmarks are awesome, and I think I'm becoming addicted to them! Found this as virtual cache, so logging here as a found benchmark. Near by an other cache, this one has been seen. Found it as a part of a virtual cache. It's my first benchmark. Found while passing thru town. Found it easily as it was part of a virtual. My first benchmark, also happend to be a virtual!! 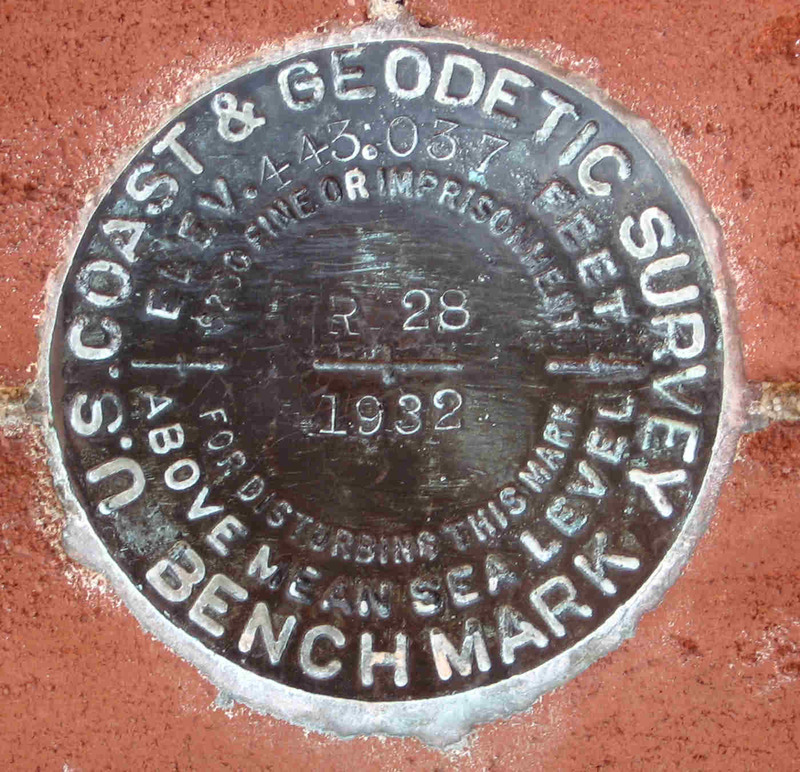 I found this benchmark on a virtual tour near the old Frisco depot during my research for the virtual cache 'Train Trex #7 (Van Bueren Depot)'. This is our first benchmark. Greetings De Flowerpowers from the netherlands. We found this one while looking for another cache in the immediate vicinty... This is only our second benchmark, and let me tell you, the way these are done is the US is sure different than in Canada. 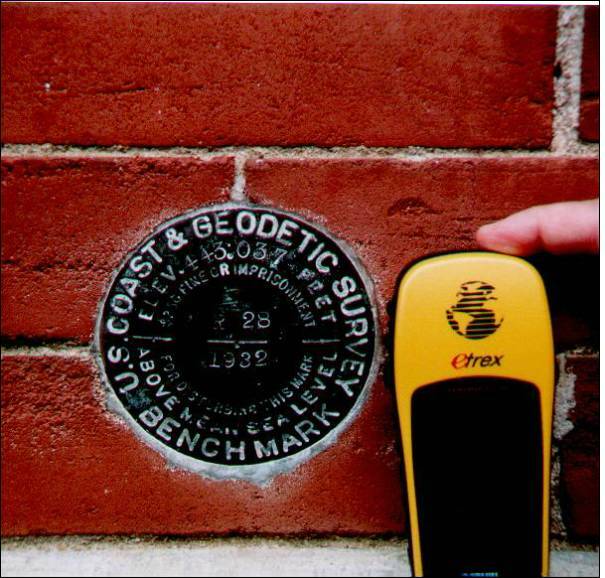 For example, none of our survey disks are on buildings. Either way, this is great, thabks!!! A nice find on day 4 of CJ²'s (That's bish0p and Neko & Hirri for those that don't know who CJ² is) 3500 road trip of the Southern States. Found it while looking for a virtual cache. 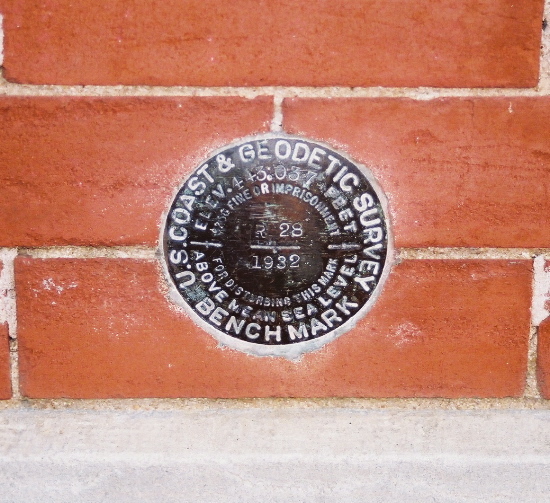 Found this benchmark while finding the virtual cache here. 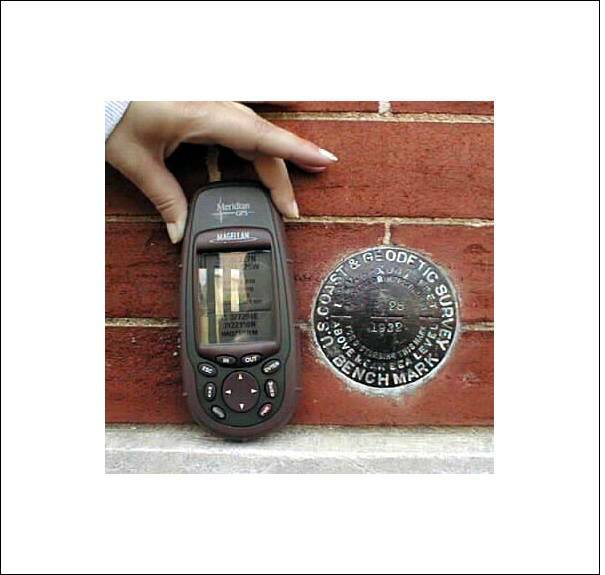 Found this Benchmark during a search for a virtual cache. Thanks. Discovered it along with a virtual cache. My first benchmark! Greetings from Germany. Found this while looking for caches today. Found in good condition. A really nice mark. 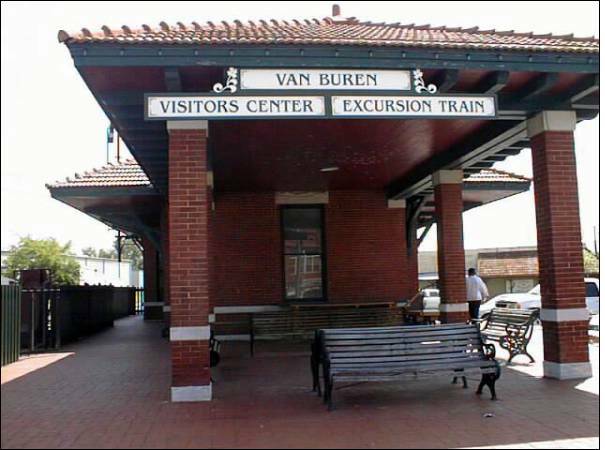 Discovered this while researching the train station. Found while getting data for the virtual cache. Easily found in good condition. Found easily, love those BMarks. I was going to upload an image, but some of the previous images of this benchmark are so good, there is no need to waste the bandwidth. 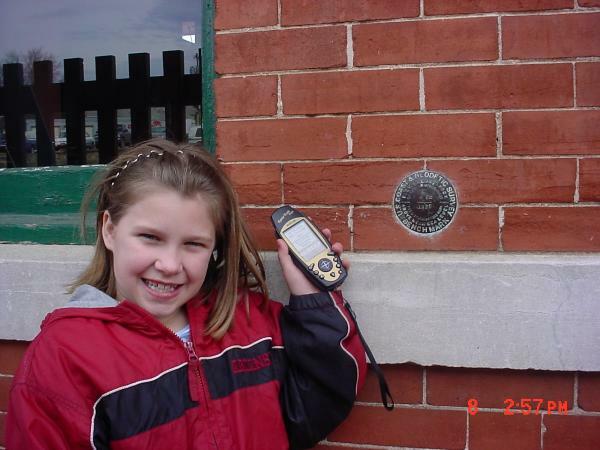 I like benchmarks that bring you to historic places. Found as I was geocaching a virtual cache. 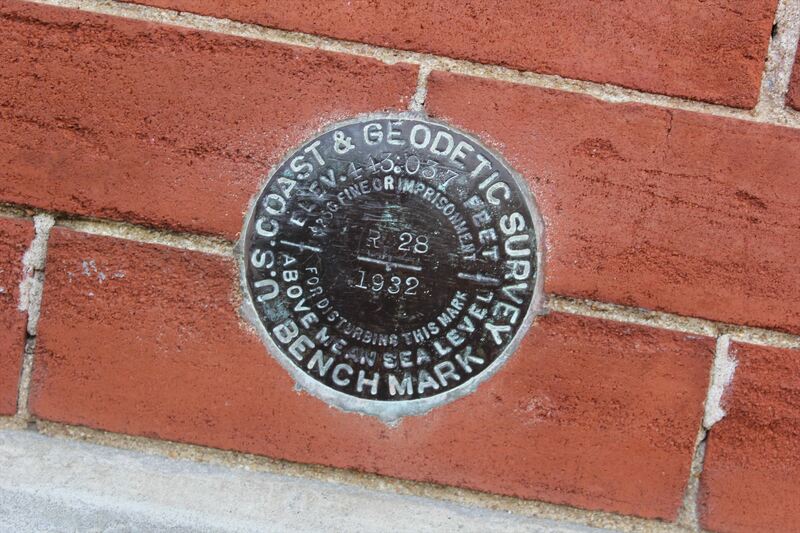 This is my son's favorite benchmark found, because he likes the red brick setting. This is an easy find. Look on the railroad side. My first benchmark! Found along with a virtual. I've noticed there's alot of unfound benchmarks...I wonder, can benchmarks count as FTFs? Found it easily as part of a virtual cache. Found as part of a virtual cache!! Love those two-fers!! Found as a part of a virtual - two birds - one stone - sweeeet! Benchmark is in great shape. I saw it when I logged the nearby cache. Found this one safe and sound. We were passing through on a trip from MO to TX and thought we would pick up some geocaches in the area. Yipee when you can find a benchmark too! Found it as part of a virtual, woohoo! Caching today with bmwrider2 and got this twofer - Train Trex #7 cache & the benchmark. 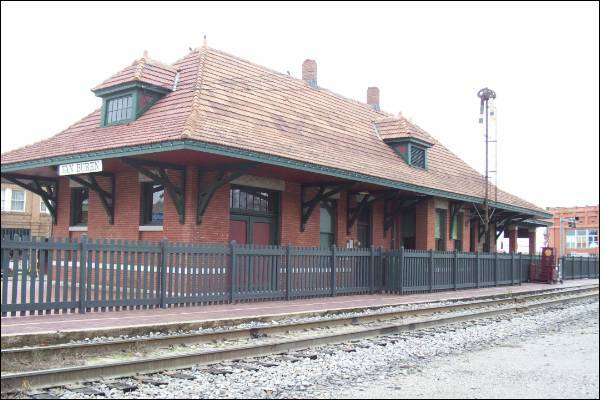 Very nice restoration of the train station! Found it in good condition. It is part of a geocache. Claiming this one with the virtual. Looks good to me. Found it with no problem. Found this one as part of a geocache. It's in great shape. Found this one as we were in the area scoring a few caches! found it as it is the anwser for the Virtal cache at this location. 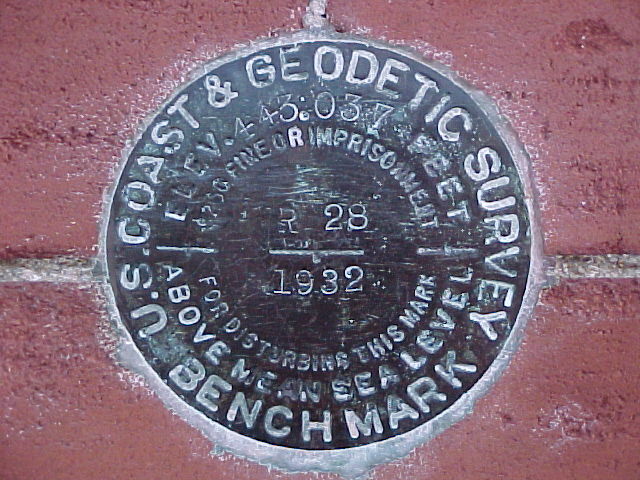 Found this benchmark after the VanBuren train ride. Late to log. 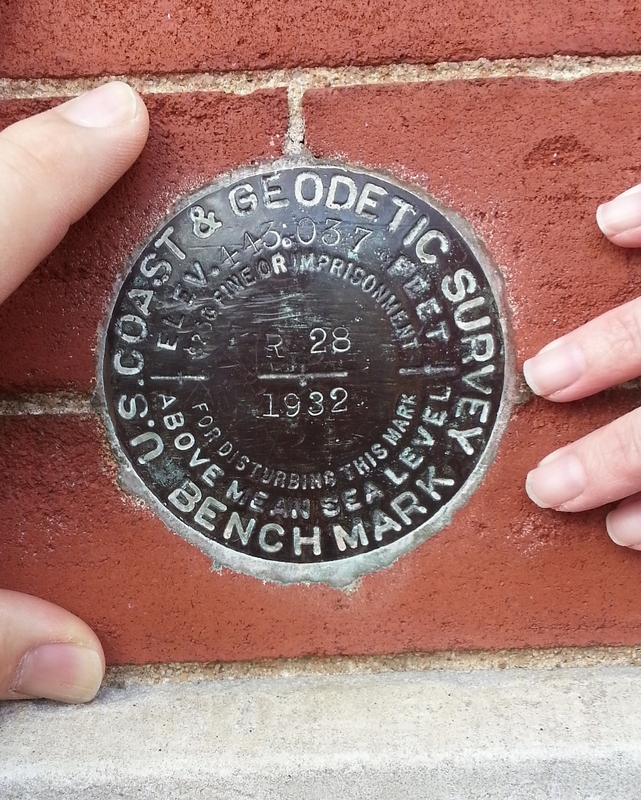 Found this benchmark with my sister when we took the Springdale-Van Buren train ride. Very nice ride. Found while Geocaching. The year on benchmark was required to claim virtual cache. Found this as part of a Virtual Cache way back when. Although found many times and recently, will log this for the benchmark. Found while doing the Train Trex # 7 cache. Actually found this the Saturday after Thanksgiving when logging the virtual cache. Didn't get around to logging it until Jan 15. Found on a day of Geocaching w/MustangAnnie & hvfd. Cool depot. Looks like it'll be there for a while. Found this on our day of caching. Right there where they left it. 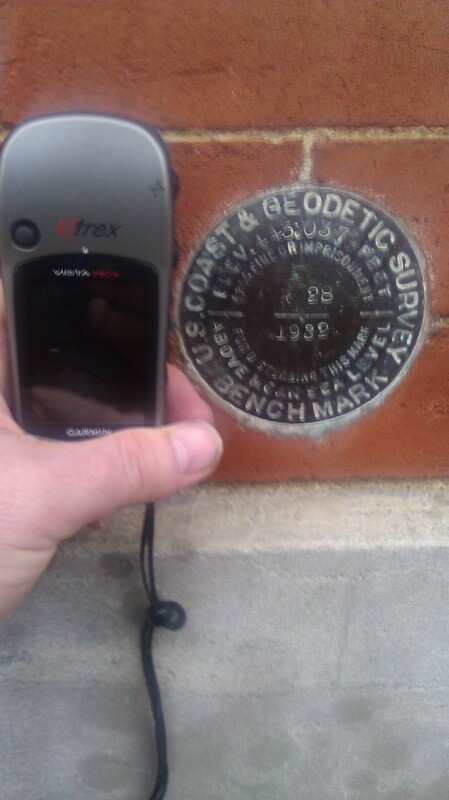 We actually found this one in March but didn't think to log it as a benchmark we only logged the cache. So today we went back for the information to log the benckmark. Located on the hunt for a geocache. Found this while doing a local geocache. Found this while doing Virtual cache. GOT IT WITH TIGGR WHILE DOING THE CACHE. THE PUBLISHED COORDINATES OF BENCHMARK ARE WAY OFF. JUST SOUTH OF STATION,1949 MARK. GOT WHILE DOING THE NEARBY CACHE. First benchmark! Now on the search for more! Really neat stuff! 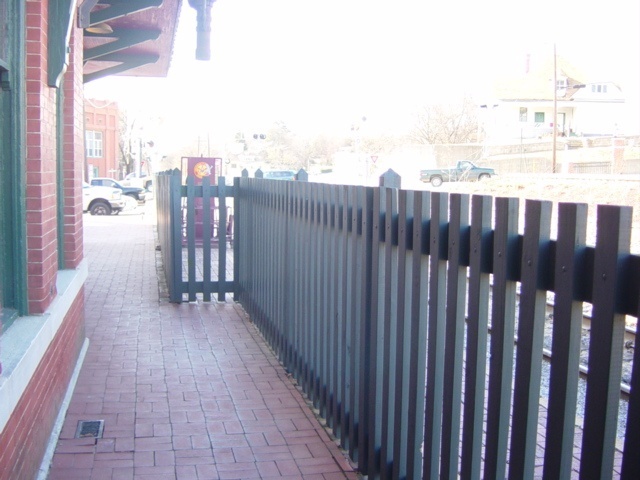 I've lived here for 6 years and always wanted to visit the train station. I took the family to find this one. 1:10pm. Found it while logging the local cache. Found it mounted on the depot. This was one of those venture that didn't require briars..
AbbysGrammy and I located this one during our tour of Van Buren. This is a neat litle town with lots of shops. 1 of 2 benchmarks found today with Arkansas Trailblazer while visiting in Van buren. Found this as part of the Train Trex 7 cache. I too logged this as part of Train Tex #7 and a marker find. Found this as part of the Train Trex #7 cache hunt. 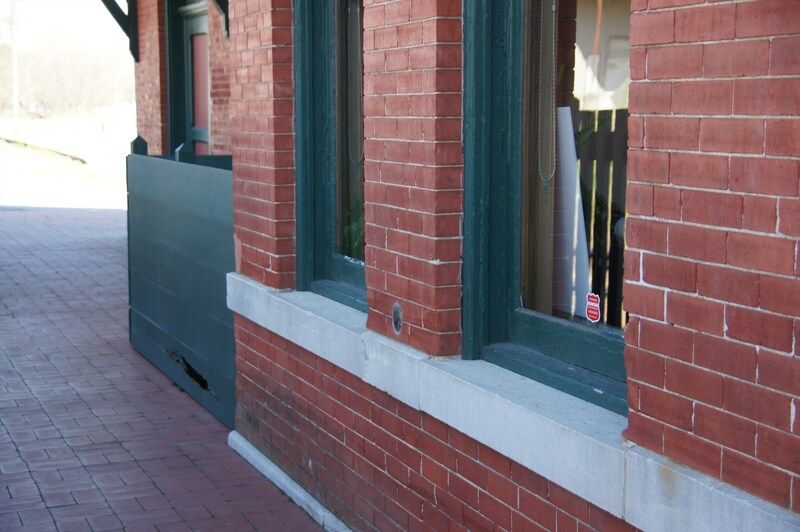 This was the objective of a virtual cache. Didn't know it was a find of it's own. Now I'm looking for these to. Really neat depot. Found this one on our way back from Mt. Magazine. Took this photo by flashlight. Reversing the colors brought out the numbers where they can be more easily read. Found this one in the rain while doing the Train Trex #7. Facinating area of town! Very nice train depot. Loved the area! This one was a part of Train Trex #7. I enjoyed being at the station. A train went through just as we were there. Still here. Found it while visiting Baron Von TNT's virtual train cache. Found this one while waiting on a train. 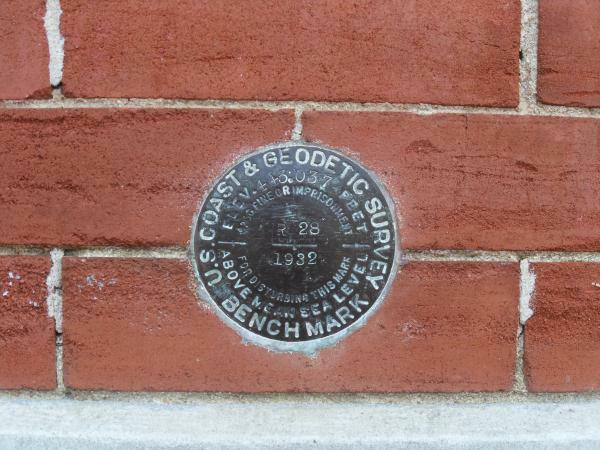 DESCRIBED BY NATIONAL GEODETIC SURVEY 1959 AT VAN BUREN. 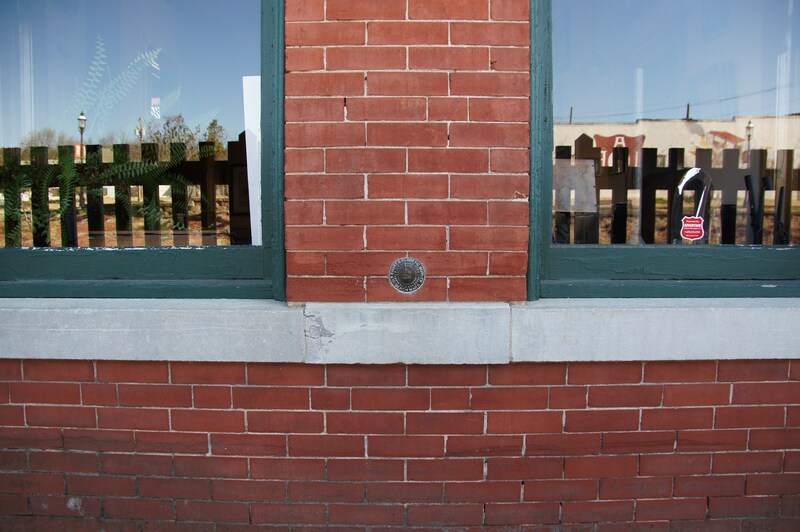 AT VAN BUREN, CRAWFORD COUNTY, IN THE BRICKWALL OF THE ST. LOUIS-SAN FRANCISCO RAILWAY STATION, BETWEEN THE TWO WINDOWS OF THE AGENTS OFFICE, AND 3 FEET ABOVE THE GROUND. A STANDARD DISK, STAMPED 443.037 R 28 1932 AND SET VERTICALLY. RECOVERY NOTE BY US POWER SQUADRON 1987 (MFS) RECOVERED IN GOOD CONDITION. RECOVERY NOTE BY NATIONAL GEODETIC SURVEY 1989 RECOVERED IN GOOD CONDITION. A NEW DESCRIPTION FOLLOWS. 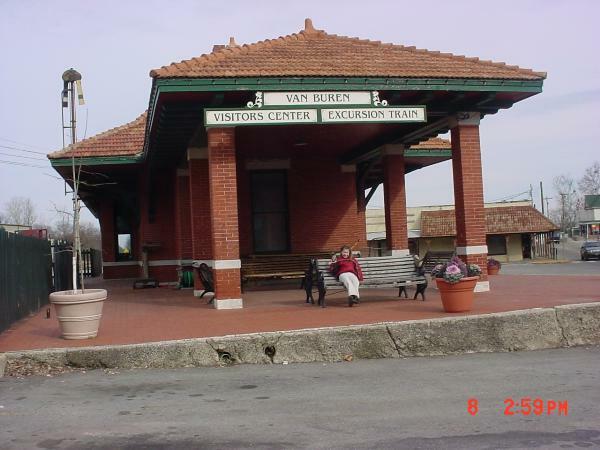 IN VAN BUREN, AT 813 MAIN STREET, SET VERTICALLY IN THE NORTH FACE OF THE RAILROAD STATION, BETWEEN THE TWO WINDOWS OF THE AGENTS OFFICE, 13.7 M (44.9 FT) SOUTHWEST OF THE NORTHEAST CORNER OF THE BUILDING, 4.3 M (14.1 FT) SOUTH OF THE NEAR RAIL OF THE ARKANSAS AND MISSOURI RAILROAD, AND 0.8 M (2.6 FT) ABOVE THE LEVEL OF THE TRACK. The horizontal coordinates were scaled from a topographic map and have an estimated accuracy of +/- 6 seconds. 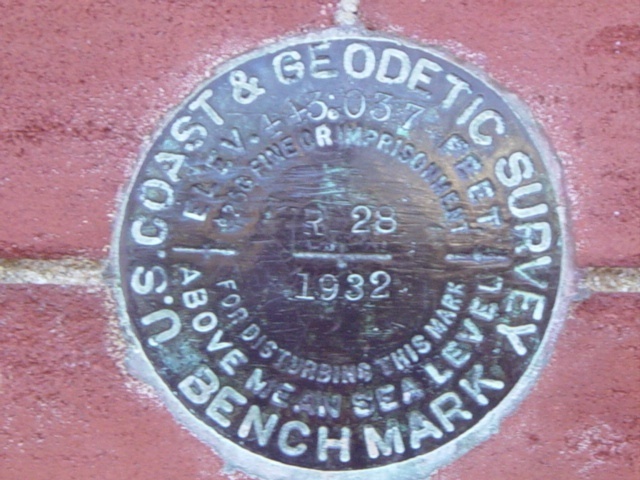 The orthometric height was determined by differential leveling and adjusted by the National Geodetic Survey in June 1991. The geoid height was determined by GEOID99. The dynamic height is computed by dividing the NAVD 88 geopotential number by the normal gravity value computed on the Geodetic Reference System of 1980 (GRS 80) ellipsoid at 45 degrees latitude (G = 980.6199 gals.). The modeled gravity was interpolated from observed gravity values.